A bot is a computer compromised via a malware infection and can be remotely controlled by a cybercriminal. The bot or the zombie computer is used by the cybercriminal to launch more attacks, or to bring it into a collection of controlled computers, called a botnet. Almost half of the traffic on the internet comes from bots, which are bits of code produced to carry out automated tasks. There are good bots like those that index content for search engines, enabling people to find websites in a much easy manner. It is the bad bots that create havoc on websites. These malicious bots expose data, steal intellectual property, shut down entire websites, and exploit vulnerabilities. Bot protection and management is thus a vital part of modern website security. 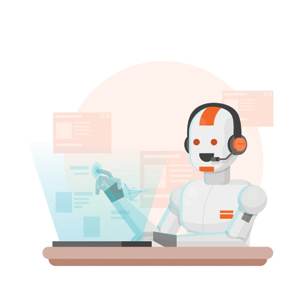 Bot management is one feature of application security software that finds whether a traffic request comes from a machine or from a human and then blocks or controls non-human and other suspicious requests. Websites and applications need the intelligence and resilience of a scalable network to fight against malicious bot attacks. Bot protection is thus a growing necessity that will help strengthen your websites' defenses. This is another common use of a bot. A denial-of-service attack focuses on invading a network or an Internet service provider in order to disrupt service. The attacker tries to get as many computers infected as possible just to have a bigger botnet network. In this method, attackers use bots to brute force, or utilize stolen credential databases, in order to access customer accounts. These attacks are considered to be the source of fraudulent transactions, money transfers, identity theft, and exfiltration of data and intellectual property. Sneakerbot is a popular checkout fraud bot that aims at buying online products limited in quantity. Due to this, it lowers average purchased amounts, reduces repeat customers, and also damages supplier relationships. This is a machine that automatically distributes spam e-mails. These e-mails mostly contain computer viruses themselves or advertisements for uncertain products. Generally, a spammer purchases a botnet from a bot herder in order to use the infected computers and send out the spam e-mails hiding where the attacks are actually originating from. Content scraping bots focus on stealing information mostly used for creating phishing sites, for stealing copyright materials and intellectual property, and also for competitors to offer lower pricing. This will result in major financial loss, whether it is from a malicious actor or from competitors. Spyware is malware used to gain information from its target. This information can include anything from credit card information and passwords to the physical data contained within files. A bot herder will use these details to sell the data on the black market. If a bot herder gets control over a corporate network, these can be even more profitable, as they will be able to sell the “rights” to their intellectual property and their bank accounts. These bots make attempts to connect to dial-up modems and then force them to dial phone numbers. At times, the effect is to tie up the line, ultimately forcing the user to change numbers. There are also times when the effect is to dial into premium phone numbers in order to accumulate charges on someone else’s bill. This type of attack is actually less used these days as people are moving away from dial-up modems to broadband connections. With this type of attack, a bot herder will be able to sneakily click links on websites and online advertising in order to boost numbers for advertisers and produce more money. Blacklisting individual IP address or whole IP ranges is considered to be the most basic way to block bad bots from attacking your website. This approach can take up a lot of time and labor. Automated bots will be able to cycle through even thousands of IP addresses simultaneously. Monitor a bad bot’s activity as it moves via your website. Understands its protocol and make use of its behavior to strengthen your defensive measures against it at the right time. You can also apply this learned knowledge to several other bad bots visiting your website. CAPTCHA tests are capable of quickly and easily remove simple automated bots unable to read and supply a correct answer to the test, while permitting human users access after they complete the test. Block pages provide an additional level of defense on top of a very basic CAPTCHA test. You can block a visitor’s access to your website by making them submit a brief request form to your security or support team. The team permits the visitor’s access to your website after the request is reviewed and approved. On the other hand, the team will completely drop the request if it is identified to be malicious or not fully submitted. Dropping access completely is the harshest threat response. This option does not provide any type of alternative, whether it is an unblock request form or a CAPTCHA test. The visitor will have to move on to target another website. To get the best results, each of these options should be as automated as possible. This will help in ensuring that bad bots are stopped as soon as possible, while good users will only be momentarily impeded while visiting your website. Hence, there is always the possibility for you to build, manage, and maintain your own bot defense campaign from scratch as part of your attempt to figure out how to block bots from a website. To ease this situation, there are also automated solutions out there that can effectively help in bot protection. One such solution is offered by Comodo through its web security tool called cWatch – a managed security service available with a Web Application Firewall (WAF) provisioned over a Secure Content Delivery Network (CDN). It also has a Cyber Security Operation Center (CSOC) staffed with security analysts who work all through the year. Comodo’s Security Information and Event Management (SIEM) is capable of leveraging data from more than 85 million endpoints in order to detect and mitigate threats even before they occur. cWatch can also detect malware, remove it and event prevent further malware attacks. cWatch performs automatic vulnerability scans to provide Online merchants, businesses, and other service providers handling credit cards online with a simple and automated way to stay compliant with the Payment Card Industry Data Security Standard (PCI DSS). The Comodo WAF is capable of eliminating application vulnerabilities and protecting web applications and websites against advanced attacks like SQL Injection, Cross-Site Scripting, and Denial-of-Service (DDoS). This WAF provides robust web security to execute bot protection measures that will safeguard both your business and reputation. Thus, the Comodo cWatch efficiently blocks malicious bots and brute force attacks from websites. It also provides protection of account registration forms and login pages from different attack vectors including protection from application denial of service, web scraping, and reconnaissance attacks.